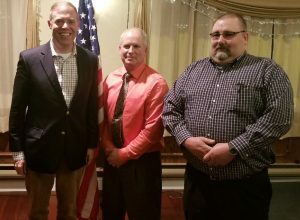 Assemblyman Will Barclay recently attended the Oswego County Sportsmen Federation’s annual banquet where he discussed legislation proposed by downstate lawmakers that would hurt fishing and game clubs. He encouraged the group to stay organized and to keep advocating for hunting, fishing and other outdoor sports. He also assured them that he is in Albany pushing back on some of these ill-conceived bills that would ultimately limit access to outdoor sports.